This is common a new business owners can become confused and frustrated with the details of factoring. I am not a factoring expert and never intended to be come one. I just want to simplify matters and show you what a considerable tool that factoring plays in solving cash demand of “too—fast—growing—businesses” while company’s cash just run-out as fast its growth. I believe that factoring needs to be a win-win situation. It needs to work for both parties (company who need factoring services and the factoring company). It won’t be an empirical study with fully math’s equation and formula. Instead, I do hope it will be a “let’s—get—it—done” form of factoring guidance. A considerable guidance on how to choose a right factoring company to meet your need. 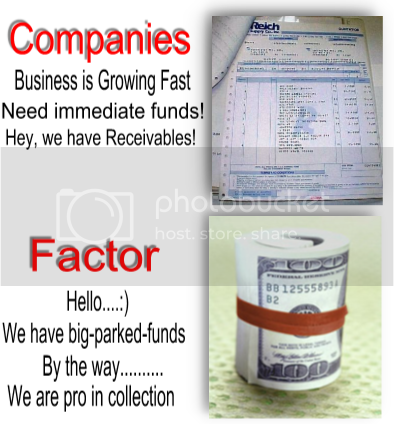 Related Topics:A Worth Factoring Buyer’s TipsAdvantages and Disadvantages of FactoringChoosing A Factoring CompanyFactoring - AppendixFactoring Fees with case exampleFinancialFundingReceivable FactoringThe Funding ProcessTypes of FactoringWhat is Receivables Factoring?